You'd never think squeezing yourself into a cold, dark and damp hole in the ground would be so much fun - yet caving is fun, challenging and a little addictive! Different caves suit different skill levels, from beginner to expert. A hidden gem, caving or potholing is great an activity for both summer or winter as the temperature underground remains constant throughout the year. 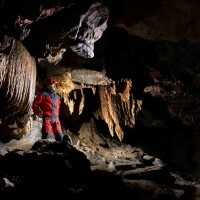 Caving is a half day activity and can be combined with other activities for a full day. The caves have a vast network of passages and offer routes of different sizes & difficulty to suit your ability and comfort levels, from big caverns to tight squeezes.